Preheat the waffle iron. Separate the eggs and stir the yolks into the batter. Beat the whites until they hold soft peaks. Fold them gently into the batter. Spray the waffle maker with canola oil spray. 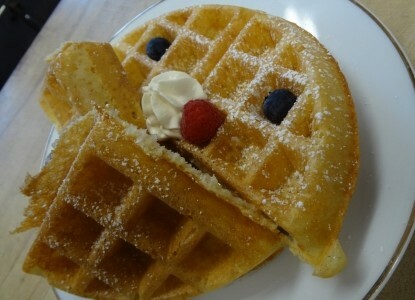 Spread batter onto the waffle iron and bake until the waffle is done, about 4 minutes, depending on your iron. (We use the KitchenAid Pro Line waffle maker, and find that it is really superior to the other makers that we’ve tried.) Serve immediately or keep warm for a few minutes in a low oven.